Hi I'm Erik and it's thrilling conducting this interview, could you please introduce yourself to the readers. Richard: Erik, I am grateful for your interest in the project, it's an experimental endeavor. 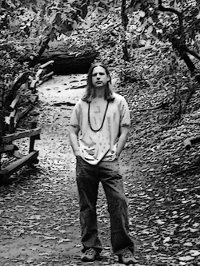 My name is Richard and I produce music using the name Mystical Sun. The idea for the project is to create soundscapes and holographic sound dimensions. Digital studios make anything possible, so the goal of the project is to find out what else is possible to create with sound. A kind of a virtual reality in sound, not bound by conventional terms. How did you first come in contact with music? And how did you happen to end up in the psychedelic downtempo scene? Richard: Music is a lifelong project, starting as far back as I remember. Mystical Sun project is my main musical endeavor and I'm fortunate to have opportunity to release the music to a global internet distribution. Because of global distribution people in places far away adopt the music and play it. Since I'm here and they are there, I'm only peripheral to them. I think people in the downtempo worlds gravitate to the music because it's very cerebral, visual and imaginary. What is you're personal reason for making music? Richard: It brings me a sense that is close to heaven. And the journey of creating music brings benefits to the spirit. Listen deeply into sound and you can travel with your mind. It's a vehicle with unlimited exploration. I'm always being surprised by new sounds and melodies, the possibilities are infinite. Music is something that brings me in touch with the deepest part of life. You really haven't released a large amount of music, yet you are very talented and create wonderful musical journeys. Why has the output been this small? Richard: I work slowly and intentionally and I am persistent. Making an album over a longer span of time gives each track different relationship to the others. Any time differences in their creation opens up more uniqueness on the album. Making ten tracks in a few months yields different results than making ten tracks over several years. This is an experimental project and I hold no expectations for it. The songs arrive on their time lines. Also I believe music that's chilled has to be made when the process of making it was equally as relaxed. I only record music when I am in the right mood, otherwise I practice playing my instruments or learn something new. Each song is like a sound painting that is moving in time and part of a series. Embedded in this painting are live instrumental performance recordings that I work to perfect. I don't let the sequencers rule the music, I stray off grid and adjust notes as individuals. Each sound is considered an entity. I think of the Mystical Sun project as virtual reality because this music resides in digital space and only touches air when someone plays it. The music doesn't exist in time and space until someone plays it, until then it exists zeros and ones, a digitally coded thought form. Why are you keeping such a low profile and not touring? Richard: The reason is I am a music producer and not an entertainer. I've focused my skills on the process of making music. In the post-mp3 age since most of the potential audience downloads the music and they are widely dispersed around the globe, there are logistical issues in being able to find enough listeners to justify all the effort. And I prefer to work on new music continuously. After an album release I move almost immediately into searching for new ways to create music, like learning new instruments or new sound design techniques. What music do you usually listen to in you're everyday life? Richard: Everything. Depends. Podcasts, music collections, new songs I'm working on. Suddenly it's possible to listen to millions of songs in vast libraries. If I get curious about a kind of music I have instant access to hundreds of albums. Specifically my current playlist changes with the days of the week. People email me and ask me to listen to their music, I try to do that. I like to listen to field recordings. There's more sound to listen to than free time to listen to it. I make it a point to hear as much diversity of sound as possible. People are always asking me for music recommendations, it hard because so many of my friends are musicians. Today, I am listening to Indian classical Sarod Ragas. All of your albums have greatly differed in feel and sound, and your music has really evolved between the albums. Of course this is one part natural development, but when you are starting work on a new album do you have any thoughts on how you want it to sound or any particular thing you want to accomplish with the album? Richard: The sound for each album is derived through process of making it. A longer span of time gives diversity in the sound of the tracks. Being different each time changes and evolves the sound. I like to reset everything after each release and create a new way for the next. Before starting an album I have a goal for it to accomplish, but often as it proceeds I follow the sounds where they lead and a different picture emerges. With the current album the goal was from the beginning to conceive it as a whole. The idea was to convey a journey with the entire album as whole. Energy Mind Consciousness is for listeners who are looking for an hour of music that can create moods and spaces. I wrote a review of your album Energy Mind Consciousness, do you think I understood your album? And could you tell us a little more about the thoughts behind your previous albums. Richard: I do think you understood, yes I agree and I appreciate your review. The music is best enjoyed by listeners who are patient enough to give it repeated listens with an open mind. Primordial Atmospheres was released in July '94 on CD. It was made at the beginning of MIDI home studios and sampling technology. Before computers could do that much. Making it was a massive effort because of the primitive technology at the time. The main gear was an Ensoniq ASR-10, TG-33, QuadraVerb, 25 MHz Mac with 8 meg of RAM and a 80MB hard drive and a Mackie mixer. An iPod Touch has more CPU power, memory and storage than the computer I used. The idea was to make a deep ambient release with two aspects. One day side, one night side. 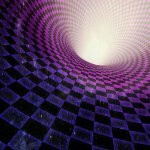 The day side has seven downtempo ambient songs. The night side has a 33 minute deep ambient soundscape. 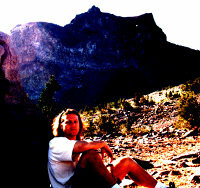 Before the next two albums Mystical Sun road the mp3.com wave. During that time the project was focused on releasing internet singles on various popular sites of the day. The dot com bubble was helpful to musicians on mp3.com who were there early on. Album production moved into the background during this period. Deeperworlds was created after the first wave of Internet music. It was a compendium of experimental downtempo and ambient tracks that were developed over a period of about a decade leading to an ever shifting album. The styles of the songs are the most varied of any of the albums. They go from super chilled beats to groove based downtempo. During this period, the goal was to combine what I'd learned making primarily beatless ambient with laid back grooves. It was recorded in a hybrid studio of analog gear and Macs. Energy Mind Consciousness is a soundtrack album. All the songs are added together in order to create a larger image. On this album, I played electric sitar, guitar and did a lot of custom sound design. It has a real dubby vibe, the most dubby of any of the albums. It's kind of a union of Primordial Atmospheres and Deeperworlds. I attempted to give it a natural feel, while still sounding electronic. The tracks follow structures that are based around structures found in nature. Infusing many principles of science and mathematics in the music while keeping it improvised and unbound. The cover for Energy Mind Consciousness is very interesting. I see it as a black whole, though it's white in the middle instead of black. There is also some mathematical formulas figuring. What were you're thoughts when creating this cover, and what does it signify? Richard: Thanks. I create the cover art because it's an extension of the music. The cover like all art is open to your interpretation. I have an interpretation and someone else may have another. It's a tunnel, not an end. There is a mathematical aspect that renders it as virtual. Think of it as a portal that you might pass through. The cover is also a representation of something that exists other spaces. It's very interesting to meet an artist that is putting so much effort and thought in his covers, can you tell us something people might not have noticed about you're other covers? I'm especially interested in the Deeperworlds cover which I always thought was one of the greatest covers I've seen. Richard: Thank you. The cover is a void filled with different mirrored portals each with a different world represented in it. The sum of the mirrored portals shows another level of a scene. Like the music the image is layered. Most web art is too low resolution to see the details and this makes the mirror portals look more like color swatches. With a high resolution version if you look closely you will see Mt. 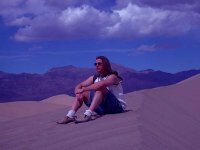 Shasta, Death Valley and a few other places in California that are special. There's even a hurricane as viewed from space. 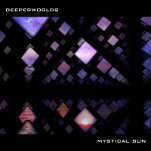 Metaphorically the cover attempts to represent the album title "Deeperworlds." What is you're take on music, I mean it has been along even since before civilization existed. How important is it? Might it have had a big impact on the evolution of human Consciousness? Richard: Music is older than speech. They've found bone flutes made over 40,000 years old. Sound is implicated in the creation of three dimensional objects, as explored in Cymatics and certain South American shamanic songs. The ratios of music are found in nature in structures and living things. Sound is a pathway to the source of the universe. Sound has already had an effect on evolution and will continue to. Ancient humans probably sang before the spoken word. I get a great feel of Eastern cultures in you're works. Where have you got inspiration for you're albums? Richard: I listen to a lot of music from the East. Indian classical music is amazing. Most unacquainted listeners don't know how to follow it because the rhythms are complex and the motifs are non-repeating, like a live jam. I prefer to listen to music that invokes something otherworldly. The Eastern cultures have music systems dating back millennia, it's ancient. The Eastern systems aren't locked into the 12 note grid like Western music is. I am very fond of Buddhism and Hinduism, I think that this worldview is much more appropriate than the one we have in the Western culture. I feel that it is important, as seeing how society looks today, that this is brought to the attention of more people, and music or the psychedelic scene is one way to do so. What is you're take on this? Richard: I have deep respect for those two traditions. They have several thousand years of history behind them. Both were established in an already ancient land. I prefer philosophies that are non-violent and about evolving yourself to a higher state. Western culture is what it is. The Eastern traditions teach that the world is maya, an illusion, and that you can learn to see through this. Once you see through the illusion you can understand the truth of everything and end your suffering. Sounds very easy, but is actually very challenging to realize. It holds out hope at some point in our incarnations we'll succeed. On you're album Deeper Worlds there is one track named "2012". The year 2012 is considered by many to be a sort of shift, where our world will change drastically in some way. What are you're thoughts on this? Richard: I have no predictions. Nothing is set in stone and anything can happen. 2012 will at least be something cultural because it's now a major global meme. All kinds of interests and trying to get in on 2012 are hype it for their own causes. I'll definitely say, I do not think it's the end of the world. 2012 could also potentially be a solar event since the global solar maximum will occur then. Meanwhile massive transformation of everything is occurring and the rate of change in the world is accelerating, everything is faster, especially communications. Are people really ready for this? Look at science and technology because it's clear that very shortly some major leaps will be made in a variety of fields that will rewrite everything. Because computing power is accelerating all fields of research and people. The entire world is a wired network now. Here is my opinion/feeling/thought. You know how on an excellently designed roller-coaster you are first treated to a pleasant and easy ride up with amazing views? It's so placid riding up until a point when it's now very obvious that there is a down to this ride? You look down and have no choice, but to ride the rest of the ride. The speed builds and the turns come fast. That's what's going on in the world right now. 2012 is a date that we have to recognize as the Maya's date. The Maya and their calendar are ancient time and math prodigies. The Maya discovered the number zero over seven hundred years before any other civilization. They calculated the year to a precision better than modern calendars. The Mayan skywatchers also tracked Venus cycles and other celestial cycles thousands of years before telescopes. Well that's all. Anything you'd like to add to your fans? Richard: Thanks for listening to the music, you have my gratitude. Please email me if you enjoy the music, let me know. I've got outposts on all the major social networks. The plan is for a new album release in 2010. Great! Looking forward to your new album. Thanks a lot for this very interesting and 'giving' interview, and good luck with you're future endeavors.